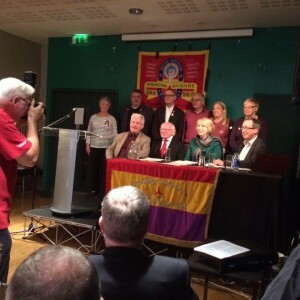 The President of Ireland, Michael D. Higgins, officially opened the Annual General Meeting of the International Brigade Memorial Trust, held in Liberty Hall, Dublin, on October 15. Seated, left to right, are IBMT Ireland Secretary Manus O’Riordan, President Higgins, Sabina Higgins and IBMT Chairperson Richard Baxell. Standing, left to right, are IBMT North West England Sec Dolores Long, IBMT Scotland Sec Mike Arnott, IBMT Secretary Jim Jump, IBMT Treasurer Manuel Moreno, ALBA Board Member Nancy Wallach and IBMT Wales Sec Mary Greening. See www.president.ie/en/diary/details/president-officially-opens-the-international-brigade-memorial-trust-agm for the full text of the address by the President of Ireland in honour of the International Brigades.